After some time, we have a another representative of automobiles from the producer with three diamonds in sign, the idol of almost all tuners – Mitsubishi Lancer Evolution SWB of a 9th generation. Its change to the one of fastest cars in the world was provided by also famous, a 28 years old tuner Simon Norris, a founder of Norris Designs company. Because Simon Norris is a defender of a performance tuning before a styling, so in this part of the article we talk about values of the stock engine..
Because this site is a tuning-oriented, a stock production isn’t very important for us, so let’s move to the modified one. As I said at beginning, Simon Norris is the tuner with ambitions for speed. But don’t worry! He took care also about visual side of tuning. As you have noticed on worldwide tuning scene, tuners use distinctive and provocative colors. Simon Norris isn’t an exception, so he bet on the Kawasaki catalogue and chose Kawasaki ZX-10 with a green pearl. 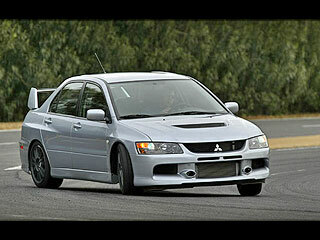 He modified a 5-seats sedan to the two-door sport car with an anticorrosive modification. He lowered a roof to ensure better aerodynamics. Also a change of stock back-up lights to the pure ones and a change of stock rear and side (with the car’s tank cap inside) windows to Lexan windows are important modifications. A safety frame improves higher safety. Of course, lighter cars are better suited for sprints, so Simon used kevlar fibre components in his Evolution XI. Thanks to them, the car thin down from 1400kgs to 1080kgs. Ladies, that’s a diet! And what all is a part of the carbon body-kit? For they searching exhaust tips in the rear bumper, it’s waste of time, they’re situated in the side doorsteps. To improve stability on the track, Simon Norris has decided to broaden mudguards and install Volker Racing CE28-N – an 9,5J18 alloy wheel disk with the Avon ZZR tyres in a 256/35 ZR18 dimension. To brake this wheels, he used 8 piston brake (32 mm vented brake disk) Brembo with Ferodo relining. In an interior, we can find only essential things for the car which want to achieve great goals. There are very comfortable and famous Sparco seats and steering wheel. A faster transmission is provided by more and more popular sequential shift. As in exterior, lightweight carbon parts (side shutters, door filling, dashboard, tank cap, deck) are also used inside the beast. A top dog in the end – the performance. It’s necessary to say, that the car was dismantled to smallest parts. And only few of them got back. A change of stock parts to the sporting ones caused high increase in the sprint performance and speed. Car uses fuel assigned for racing cars – Klotz 118 Octane Race Fuel. 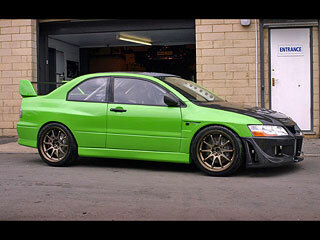 Do you like this green supersport Norris Design Evo 9 SWB?